The Chancellor George Osborne announced this afternoon that the Science Budget would be frozen in real terms until 2020. The Science Budget is and will remain lower in real terms than it was in 2010. The Science Budget is falling per person living in the UK, and as a fraction of GDP. By 2020, the Science Budget will be nearly 20% lower as a fraction of GDP than it was in 2010. Secondly, the devil is, as always, in the detail. Given other likely changes which aren’t yet clear after today’s announcements, this graph should probably be seen as a best-case scenario for UK research. This £1.5bn is significantly more than the £900m which will be required to compensate for the effect of inflation by 2020. At best, therefore, this represents government directing funds of around £300m per year towards global challenges, however those are chosen to be defined—something we are not in principle opposed to. However, a more cynical reading of this could be that cash for activities which are part of the current Science Budget will be appropriated to ensure that we continue to spend 0.7% of GDP on international development—apparently allowing the Government to both have its cake, and eat it. The other huge unknown is what will happen to departmental funding of R&D, which is a significant contributor to UK research. In the aftermath of the 2010 Spending Review there were some jaw-dropping decreases—several departments including Education and CLG slashed investment by more than 50% in a single financial year. Given significant headline cuts in research-intensive departments like DEFRA—the department responsible for agriculture and the environment—how the axe falls here is definitely something to watch. These remain uncertain times for UK research. 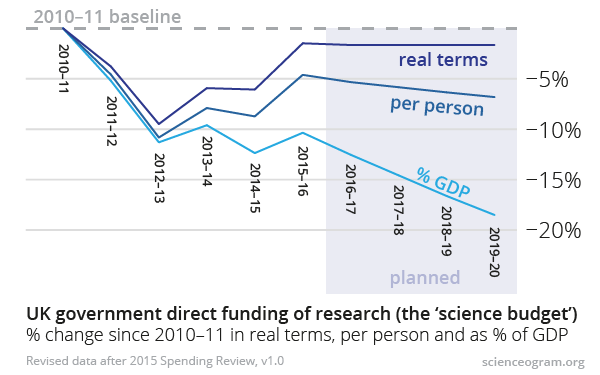 Investment in the Science Budget is flat-lining in real terms and details remain unresolved, while departmental research will doubtless be squeezed as a new round of cuts takes hold. That there is this much to analyse and discuss is astounding when looked at from the Scienceogram perspective: we still invest just pence per person per year researching deadly diseases and new kinds of energy. The outcome of this Spending Review isn’t as bad as many had feared, but we are certainly due some unambiguous ambition from Government, rather than details to pick over. We updated our graph from back in July—which was based on a prediction of flat cash for the Science Budget—to account for the commitment to freeze the Science Budget in real terms, rather than cash terms. The full data we used can be found here. We inferred the figures used from the Spending Review document released online this afternoon. Please let us know if you have any comments or corrections!